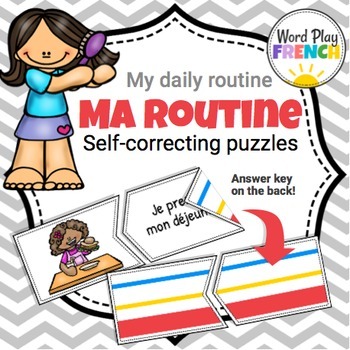 12 self-correcting puzzles in French on the subject of daily routine. 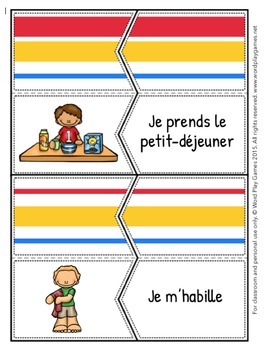 These puzzles have the answer key on the back in the form of colored stripes. This enables the student to check their work but doesn't give away the answer too early! 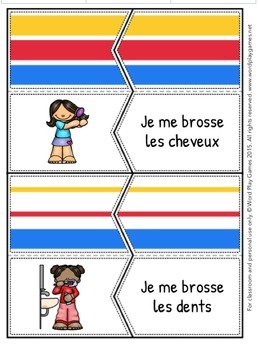 The puzzles need to be printed, cut out, folded and laminated. Note: The self-correcting part of the puzzle could be cut off and not used if you prefer not to have the answer key available or are not able to laminate the puzzles. I love to get feedback and suggestions. Please let me know what you think of this product! If you have any specific vocabulary you prefer to use I am happy to update the product to meet your needs.